Picture the following scenario: You’re driving down the freeway and suddenly it occurs to you that you must have missed your exit. You ask yourself, “How’s that possible? I really was paying attention, and I’ve been on this road many times before, so how could I have missed my exit?” At this point, you become very uncomfortable, and you may even start to perspire and experience rapid heartbeat. You may resort to cursing aloud, or yelling at yourself for not being sure of where you are. Sound familiar? The phrase ‘next exit syndrome’ describes this feeling of confusion and anticipation that result from this type of situation. Often the feeling of disorientation can be so strong that you even plan to get off at the next exit and go back to see where you went wrong. I have even been tempted to pull over and check maps or call On Star. Those with the active maps apps suffer very little from this syndrome in the car, but are also prone to its appearance. The ‘next exit syndrome’ produces a moment or two of fear, panic, frustration, anger, maybe even rage at . . . whom? Usually this rage is directed at yourself as you mutter, “How could I be so. . . .(fill in the blank)?” After you get over the initial shock of thinking you’ve missed your exit, a very strange thing occurs. 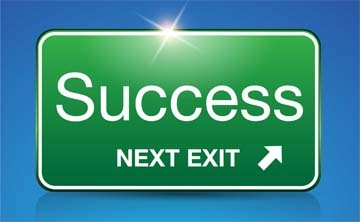 As the next exit appears, you realize that it’s the one you wanted to exit at in the first place! “Magic” you say? No, it was a premonition that you didn’t recognize when it first occurred to you. This means that you have the power to look into the future and recognize that an opportunity is poised to present itself to you even when you’re distracted. Actually seeing the future happens more often when you are distracted. What do you have to clean up, or change, or learn in order to let success overwhelm you and become your way of life? What is it that can set you on ‘the path’ that you need to follow with a big grin on your face every day? Here’s a secret, “You already have all the knowledge you will ever need to succeed.” I have been coaching for almost forty years and with a couple of rare exceptions, all of my clients have had all the knowledge they needed for success before I ever met them. What they needed was the belief in themselves, a super cheerleader, and someone who would hold them accountable for their actions. Having a coach is one way to accomplish all of these requirements, but it’s not an absolute necessity if you are willing to listen to yourself more closely. How does it feel to find out that you have the ability to sense the future? How does it feel to know that you can control the rate of your success, and that you can design the life you want? This awareness is almost as spooky as the ‘next exit syndrome’ when you first discover you have this kind of power. Your challenge is to notice any time you have the feeling that you missed something important and initially can’t figure out what it was. Then become hyper-aware of what comes to your attention because opportunity is knocking on the door of your future. Your job is to answer the knock.